You walk into an empty room by the sea, to find a perfectly circular hole punched out of the concrete floor where a vortex of water swirls and crashes with perfect rhythm. It sounds like an optical illusion, but it's real. It's the latest work from artist Anish Kapoor. Kapoor's art is always dreamlike, whether it's filling a 19th century Parisian building with enormous balloons or installing a giant reflective bean that turns Chicago perfectly upside down. But in India this month, the UK artist unveiled a piece that's somehow even stranger. 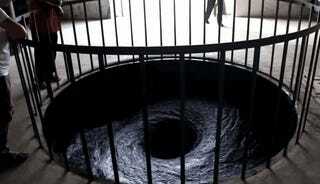 It's called Descension, and it's installed inside a 10-foot-wide, 10-foot-deep hole in the floor of the building in Kochi, India, as part of the Kochi-Muziris Biennale. It took 50 laborers seven days to dig the ditch for the 3-meter-deep, 3-meter-wide, 4-ton whirlpool. You see, his work was located very close to the sea - that's how he wanted it. So when we were digging, we also had to be really careful not to go too deep and flood the space with seawater. We actually called in a structural engineer to help.